The New Zealand Geographic Board Ngā Pou Taunaha o Aotearoa recognises the importance of locality and suburb names and their extents. These names and their areas are important for correctly identifying locations, which are essential for emergency services and property addresses. They are also important for government administration and provide identity and association for local communities – giving a sense of place and belonging. The Board also recognises that populated places are bounded by naturally defined geographic boundaries or infrastructures. But they can also be subject to growth so boundaries may need to change. Urban growth and development result in new subdivisions. These are usually named by the developer and can become established in every day use over time. However, they are not official and may not reflect good naming practice (eg duplicated names may cause confusion). Therefore the Board encourages and welcomes Councils, developers and communities to make formal proposals to it to officially name their suburbs and localities – see Proposing Names. The Board welcomes Councils’ advice on the boundaries of their localities and suburbs. The Board also asks for Councils’ views on proposed names, however the final decisions on official suburb and locality names and their boundaries is the Board’s or sometimes the Minister for Land Information’s. 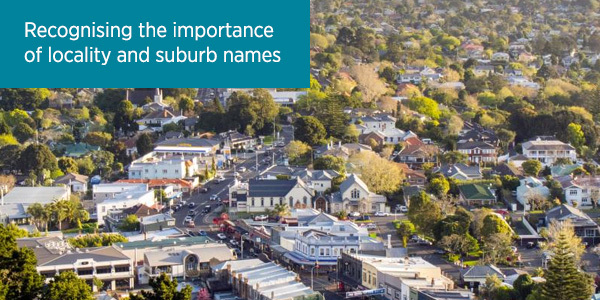 Having official suburb and locality names provides certainty, protects community identity, minimises the risk of incorrect naming, and ensures that the official name is used in official publications. They also reduce the likelihood of having to change unacceptable names that come about from urban growth and development. One of the Board’s goals is for every Council area to be divided into a nationally consistent set of suburbs and localities, with official names and boundaries that are used as authoritative descriptors for address and location. The Board is responsible for naming geographic features including places which include suburbs and localities – see the Board’s jurisdiction under s.10 of the New Zealand Geographic Board (Ngā Pou Taunaha o Aotearoa) Act 2008. Section 4 of the Act describes a suburb as an identifiable area within a local authority area, usually urban in character, with facilities such as those for education, transport, and shopping. A locality is described in the Act as an identifiable area within a local authority area, usually rural or partly rural in character. Apart from the legislative provisions of the Act, the Board is also mindful of the ‘AS/NZS 4819:2011 rural and urban addressing’ standard, which sets out good practice for Councils to follow for defining and naming suburbs and localities.